Azerbaijan is expected to participate with the largest team of wrestlers at the upcoming second European Games in Minsk, said Anar Bagirov, director of the international relations department of the National Olympic Committee and the head of the mission of the Azerbaijani delegation at upcoming sporting events on February 11. Azerbaijan has achieved big results in sport this year, not only winning the high number of medals, but also successfully organizing inaugural Baku 2015 European Games in June. 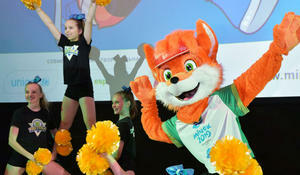 The next General Assembly of the European Olympic Committee in Prague will discuss the second European Games, the Youth and Sport Ministry reported. Today, Azerbaijan is known in the international arena as an authoritative country, pursuing an independent policy, prominent for its principal position, and making a valuable contribution to solving global problems. Azerbaijani athletes showed their best this summer at the inaugural European Games in Baku, winning second place in the overall ranking, and have now thrust themselves into preparations for the Summer Olympic Games. The Baku 2015 European Games has been entered into the history of sports in Europe. The inaugural European Games set the bar for the new continental sporting competitions that will be held in Europe once in 4 years. European sports officials admit that the sporting event held in Baku on June 12-28 was not any less important than the summer Olympic Games. The first European Games have significantly contributed to the development of the tourism sector in Azerbaijan, the Tourism Ministry said.